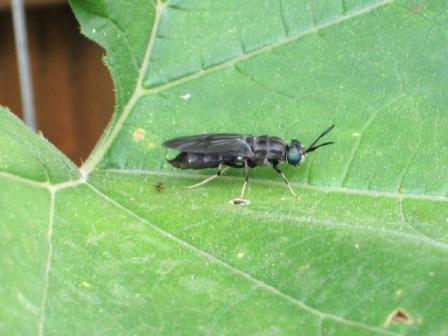 Black or purple wasps are either soldier flies which are the adults of the commonly-seen compost maggot or mud daubers. Neither sting and both are highly beneficial. Soldier fly maggots help break down compost and mud daubers kill spiders. Mud daubers most common victims are the black widow spiders. Soldier flies can’t sting and the mud dauber females only sting if grabbed. So don’t do that! Biology and life cycle: Eggs are laid in decaying organic matter, wood, mud, and dung. Larvae are maggot-like scavengers or predators. All are thick-skinned and somewhat flattened. Pupation occurs in the last larval skin. Adults are dark, sometimes banded flies. All life forms are found in the same habitat. 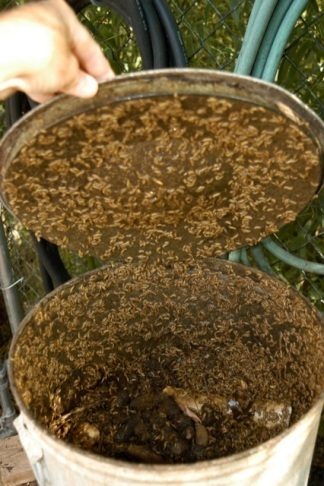 Black soldier fly larvae feed on decomposing matter, including kitchen scraps that should not go into a compost bin. Habitat: Wet, low-lying areas, sappy wood, dung, and wet soil. Feeding habits: Adults feed on flower nectar; larvae feed on decaying organic matter. Economic importance: Help with the breakdown of organic matter, especially dung. People raising earthworms find the manure-feeding larvae to be very helpful.